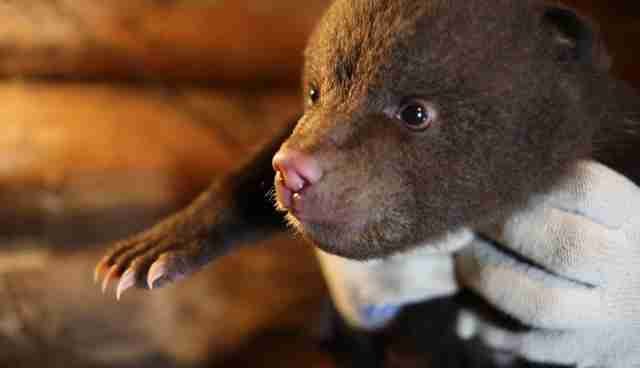 Seven orphaned bear cubs are now being rehabilitated at IFAW's Bear Rescue Center in Bubonitsy, Russia. The first bear arrived on Feb. 10. 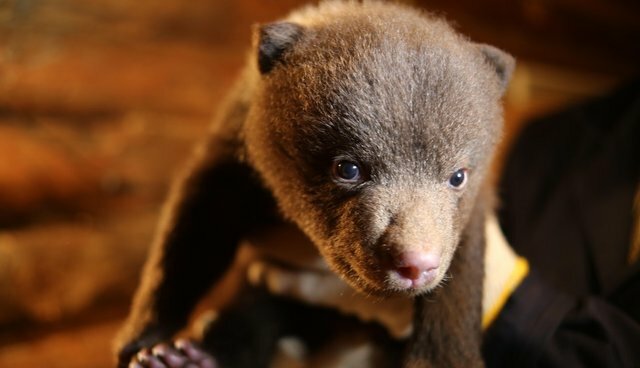 It was a month-old male cub, with eyes and ears already open (a bear cub's eyes usually open on day 17 and ears on day 32), and weighing in at 1.9 kilograms (approx. four pounds). The bear cub was from the Northern Russian region of Republic of Karelia. He was picked up by a father and son who were walking in the forest with their dogs. The boy was interested by what seemed to him a bird's song and stepped away from the path in the snow to approach the bird. But he was suddenly surprised by a huge bear's head and started crying. His dogs rushed to him and the bear ran away leaving behind a small bear cub. Seeing this scene unfold, the boy's father yelled at the boy to protect the cub from the incoming dogs and the boy quickly fell on the snow covering the cub with his body. 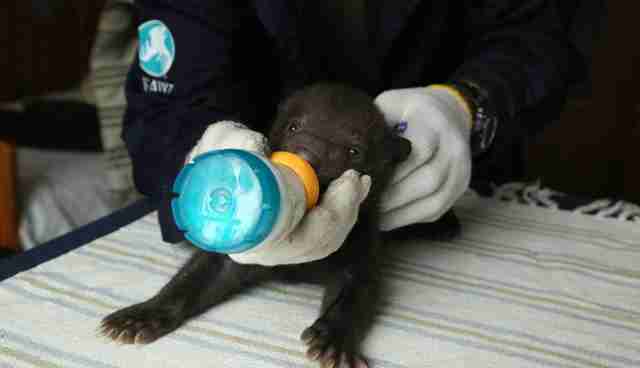 Father and son took the bear cub home where they bottle-fed him with the baby milk formula. The bear cub spent 10 days with them and then the father called IFAW's Bear Rescue Center requesting the bear cub be taken in for rehabilitation Now, the healthy cub is fed every four hours with the same baby milk formula, drinking 90 milliliters per feeding. As soon as the bear cub is acclimatized, the formula will be gradually changed to a more appropriate one for carnivores. Three more bear brothers, all siblings, arrived at the Center from the Kostroma Region, located 700 kilometers (approx. 434 miles) away. IFAW staff received a call from the Kostroma Region Department of Natural Resources that they expected three bear cubs from their local staff. It was said that tree loggers unintentionally frightened a mother bear from her den. The loggers understood that there were bear cubs left in the enclosure, but they decided to wait for the night in the hopes that their mother would return. Alas, the female bear never did. Fortunately, the temperature kept around zero degrees Celsius and the bear cubs survived the night. Center staff made a two-day trip to bring the cubs in. The bears were larger than the first cub (about two to three weeks older), in good health but one bear cub was coughing - this was because the cubs spent a night in the cold den. He was quickly treated with antibiotics injections and is now better. Then three more bear cubs arrived earlier this week, on the first from the Tver Region! A forest ranger was in the forest evaluating the plots for logging when he fell through the snow and into a bear den. The frightened female bear ran away leaving her cubs behind. The ranger didn't take the bear cubs hoping that the mother returned but called IFAW specialists for consultation. We recommended she take the bear cubs immediately as there was no evidence that mother bear would return to her den and the small bears were sure to freeze to death soon. 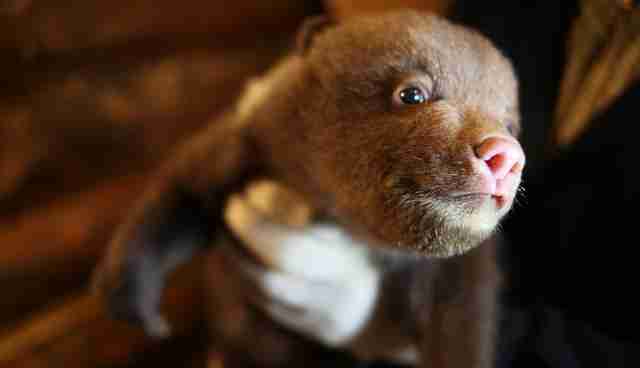 The bear cubs are all male, approximately six weeks old and weigh 3.1, 2.6 and 2.3 kilograms (approx. seven, six and five pounds). The two larger brothers started to eat on the second day of their arrival. The smaller one started to eat only on the third day and during the first two days was rehydrated orally and with subcutaneous injections. Now all seven bear cubs feel well. They are bottle-fed five times a day with formula. The oldest ones, from Kostroma, already started to walk! The bear cubs from the Tver Region who are two weeks younger, are only now learning to walk. Soon the bear cubs will be switched to oat porridge meals. 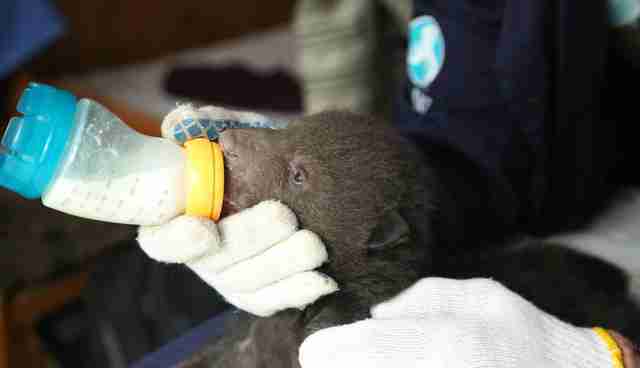 I find the stories of these bear cub rescues so encouraging. It sounds like people care about these cubs, and wish them well. I was very moved by the father who called for his son to protect the cub from the dogs, particularly when it would be understandable if the father had panicked to protect his son from the mother bear and focused only on the child. His quick thinking in compassion for the cub was wonderful. It was a very valuable lesson for the child to learn.